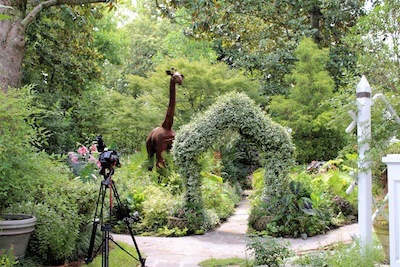 Three shows are coming up soon on PBS/ETV GardenSMART that are extra special to me. That’s because I scouted the five gardens you will be enjoying in the three episodes. Avid gardeners who know how to get their hands dirty tend these beautiful gardens. I owe special thanks to Betty Norris & Laura Lander, Publicity Co-Chairs from the Cape Fear Garden Club, who drove me to many wonderful gardens during the Garden Tour in Wilmington, North Carolina. Our January 5th post highlighted several shows that dealt with a noteworthy Cape Fear Garden Club, Garden Tour. They are having another fantastic garden tour in 2016. 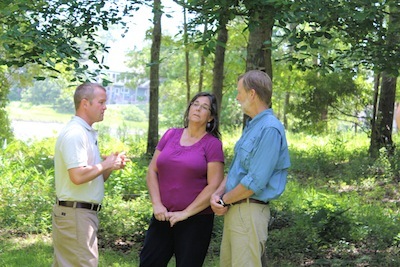 Click here to lean more about their 2016 Cape Fear Garden Club, Azalea Garden Tour. GardenSMART Show 3212 features the gardens of Debbie and Hank Phillips and Sylvia and Rex Crippen. Debbie does all of the gardening herself with help from her husband Hank, who is the lawn tenderer. Debbie wanted her home to be charming and romantic. She based the “look” on a family farmhouse in the small village of Turny, France. 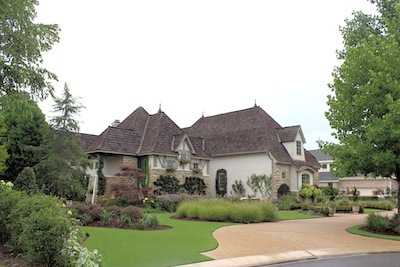 Their Wilmington home has formal box hedges and curving flower borders in the front yard. The side yards have deep flower borders leading to the entertainment areas and water feature in the rear of the home. The Phillips front door opens to a lush patio overlooking a private inner courtyard, the perfect quiet spot for reading and relaxation. When you see the show, picture Debbie up on a ladder trimming the espaliers here and there on the house and in the courtyard. The Crippen home was purchased with the plants and garden already intact. Fig vines (Ficus pumila) cover the home, making it look like a fairy tale cottage. 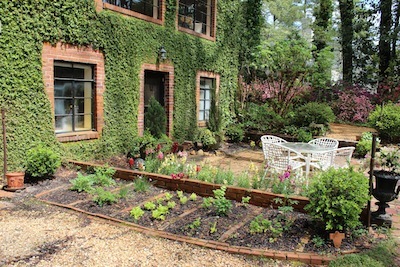 Although some vine coverings can damage homes, Sylvia says the fig vine has been an exemplary visitor, causing no harm. Although according to Sylvia, her mother was a terrific gardener, Sylvia does not consider herself one. However, when house hunting she fell in love with the quiet garden in its wooded setting. Sylvia is learning from trial and error. The flower garden was overgrown with weeds when the Crippens purchased their home. Sylvia is afraid she pulled out flowers along with the weeds and asks GardenSMART host Eric Johnson to help her identify the good and bad. Show 3211 introduces the garden of author Barbara Sullivan to the GardenSMART audience. 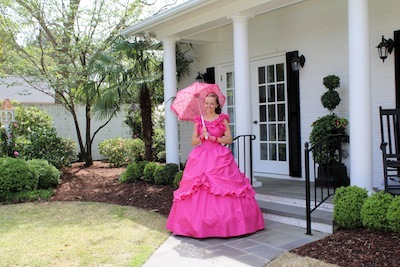 Her home and garden is located right in the middle of the Wilmington Historic District. Her garden is an enclosed city garden. Anyone visiting knows a gardener lives here. A central path with intersecting side paths and an outer boundary circle lead the visitor through flourishing plantings of annuals and perennials interspersed with shrubs. Not everyone can boast having a giraffe in his or her garden. Barbara’s resident giraffe metal sculpture, a gift from an artist friend, oversees the entire garden from his high-neck view. Look carefully and you will spot other creatures peeking out from the foliage. Barbara Sullivan is the author of Garden Perennials for the Coastal South, published by the UNC Press, and a Garden Writer Association member. http://www.GardenSMART.com/?p=articles&title=Book_Review_-_Backyard_Carolina where I reviewed his book, Backyard Carolina.